This page showcases the conservation issues that threaten the American river watershed, and also includes information about the organizations that are working to promote these issues through whitewater rafting. 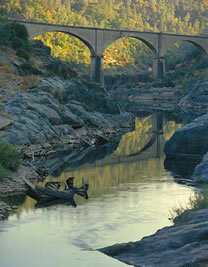 An Auburn based grassroots educational group dedicated to the preservation of the wilderness, recreational, cultural and historical values of the American River and its Canyons for all to enjoy. PARC makes public presentations, publishes the American River Guide Book, a seasonal newsletter and remains alert to the political situation of the canyons. PARC is a member of the American River Coalition which coordinates American River lobbying efforts. Friends of the River was founded in 1973 during the struggle to save the Stanislaus River from New Melones Dam. Following that campaign, the organization grew to become California's statewide river conservation group. Friends of the River is dedicated to preserving, protecting, and restoring California's rivers, streams, and their watersheds. The organization accomplishes its mission by providing public education, citizen activist training and organizing, and expert advocacy to influence public policy decisions on land, water, and energy management issues. Once again, the proposed Auburn Dam is resurfacing. To find out more information about the issues surrounding the Auburn Dam, visit the Friends of the River Website.